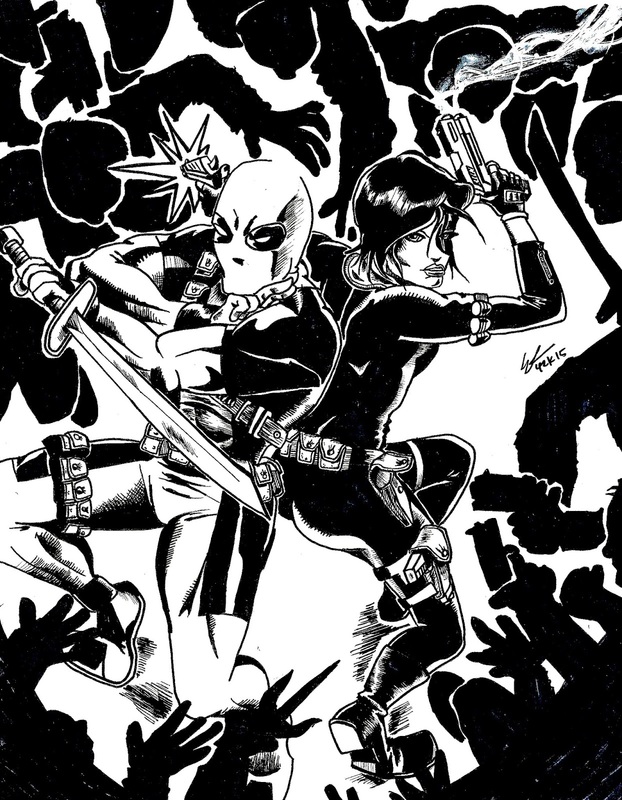 Another Long Beach Comic Con Commission I drew features Deadpool and Domino back-to-back against the entire world. I loooovvveee the way the picture turned out. The biggest reason is because I took way longer drawing this than an average commission (about 2.5 hours) as opposed to 45 minutes of an average commission. The angle of the picture is interesting because it is a downward angle, so drawing Deadpool and Domino at a slight bird-eyes view. This includes foreshortening their legs and featuring the tops of the heads more. Additionally, I made sure that Domino's black costume did not bleed into itself by drawing white lines around the bends of her joints, wherever her body crosses with itself, and when it is touching Deadpool. The pens I used were a Papermate flair medium size marker (the standard pen I use for a commission), a .01 cm art pen for the small feathering details, a .03 cm pen, a Sharpie marker for the heavy black shadows, and a White Out pen for that gun smoke effect (made better by some slight smearing by my fingers).